HHVM stands for HipHop Virtual Machine.It is the technology used by Facebook to power their own website.You can also power your website with HipHop virtual machine.It can only be used if your website is powered by PHP.Currently it may not work with all the PHP based content management system out there.It was not compatible with WordPress also.But with WordPress version 3.9 things have changed.Now WordPress and HHVM are fully compatible. I tried configuring this website to use HHVM.I am currently using PHP5-FPM along with ngx_pagespeed on this website.For almost all website out there PHP5-FPM will work fine along with any decent caching solution.I have written a separate tutorial on ngx_pagespeed.PHP5-FPM and Nginx combination is working great for me.But I thought to give HHVM a try.It is worth mentioning that I have tested it successfully on this website. I decided to keep my ngx_pagespeed setup as it is and replace PHP5-FPM with HHVM.I was not sure whether ngx_pagespeed will create any problem or not.But in theory it should not make any problem.In the end my assumption was correct.ngx_pagespeed worked well with HHVM.The steps mentioned below was carried out for this website and on live environment.I would like to mention that you can use it only if you are using VPS or dedicated server. The HHVM website provides detailed commands to install from source.I will not cover them here.I will cover instructions for Debian 7.In case you are using different distro you can read the installation instructions in this post. The instructions on HHVM site does not mention commands in second line (given below).This command is necessary.You will not be able to upgrade the packages later with apt-get upgrade command.So it is better to add the key. For installation I would recommend using pre built packages.It makes installation process easy.You do not have to deal with dependencies related problems.I faced no problem installing it on my Debian server.After installation is complete you will see messages as shown in below image.HHVM provides post installation commands you might have to run.This information is important.You can take screen shot of it for reference. After adding this line you should comment out below lines.In Nginx configuration # is used to comment out the lines.You basically need to comment out all the lines between location and closing }.These lines are used by PHP5-FPM.So we are commenting this out.HHVM will use configuration inside hhvm.conf. Now configuration part is over.We need to test the configuration.As I already had my website running.It was easy for me to test the configuration.We will reload Nginx configuration to test and try to browse the website. The first command will test the configuration for syntax errors.The second command will load Nginx configuration.Now you can browse your website and see if there is no Nginx error.If there is anything wrong then you will get 502 error.This is it.You do not have to make any additional changes. This section is important.If you have PHP5-FPM installed on your server and is working then this section is important for you.I was using PHP5-FPM on my server.I installed Hip Hop Virtual Machine on top of it.The above setup was working fine for me but after few seconds I was getting 502 error.After jerking my head few times I recalled PHP5-FPM is active on my site. It will not serve the pages.But it will eat up the resources.So I used below command to stop it.In case you have PHP5-FPM on your website then stop it before following steps mentioned in HHVM and Nginx configuration and running it. You can remove it from your server.But you should not remove it immediately.It is better to test HHVM for few days and then take your decision.Having it installed on your system will help you going back to your configuration easily. After changing port in this file you need to change hhvm.conf file inside /etc/nginx.Remember this file is created while configuring your web server for HHVM.You need to change the line shown below.Just change the port 9000 to the one you used in server.ini file. You can view these log files to get an idea of any HHVM errors. By default HHVM listens on port 9000.As with PHP5-FPM HHVM also performs better if listens to unix socket.So we will make some changes in HipHop Virtual Machine configuration files mentioned above to make it listen on socket.For this open server.ini file located in /etc/hhvm directory. Note in above code we have commented the line hhvm.server.port.We have inserted the line hhvm.server.file_socket=/var/run/hhvm/hhvm.sock.You do not need to create the file hhvm.sock in that directory.It will automatically get created. 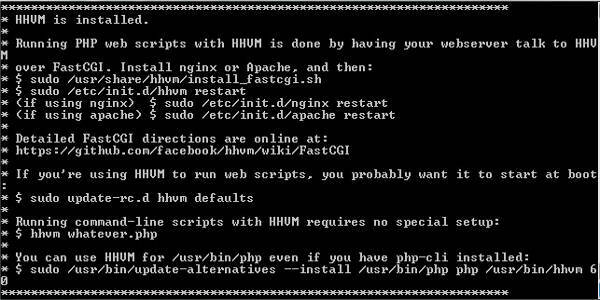 These commands will restart HHVM server and Nginx server.Your changes will immediately be in effect. I was experiencing a weird problem with hhvm-fastcgi.My site was getting 502 issues after few hours.Since my Nginx configuration was well tested it was not Nginx issue.I checked log files of hhvm-fastcgi.The problem was unresponsive scripts. These two were working fine with PHP5-FASTCGI.So I thought of adding some of PHP5-FASTCGI parameters to HHVM php.ini file.By default HHVM php.ini file does not contain much configuration parameters.I wanted to tweak some basic parameter to avoid above issue..
max_execution_time increases time for which a script will be executed.By default it is 30secs so I made it to 300secs.max_input_time is also parameter to control running time of the script.PHP.INI files provide brief details about each of the option.So I am not covering the options in detail here.memory_limit is the amount of memory available to it. The rest two variables post_max_size and upload_max_filesize control file upload to your website.SO in above case you can upload 12 MB file to your server.I set this to high value as often I need to upload big files to my server using WordPress upload. So you can safely use above parameters to your php.ini file.So can modify the values as per your requirement. You can try HipHop Virtual Machine on your website.I have not conducted any tests to check the performance gain.HipHop Virtual Machine team has conducted so many test that it is not worth a effort.Website performance tuning is combination of so many factors that taking care of any one is not going to make any difference. HHVM will only speed up PHP part of your website.You need to take care of other parts as well.I have taken care of other parts using ngx_pagespeed.The best part is you can run HipHop Virtual Machine on 512 MB VPS server also.This website is running on 512MB VPS only. Keeping everything same I felt that HHVM does made it faster.Have you used HHVM on your server or planning to do so? If yes then share your thoughts. Uncaught exception: HHVM no longer supports the built-in webserver as of 3.0.0. Please use your own webserver (nginx or apache) talking to HHVM over fastcgi. Thanks. I did that yesterday. Nothing much happened. I checked back today and hhvm and php was running. stopped php. Now the wordpress site gets a ‘500 OK’ error. Any idea whats wrong? Google isnt helping. Hello, You have some good tutorials. Learnt a lot in the ngx_pagespeed tutorial with the ramdisk. did not find that anywhere else. Nice stuff indeed! You have provided very good information in details.